Spice up your look with this playful pair of cloisonné stud earrings. What's everyone's favorite day during Fashion Week? Taco Tuesday, of course. 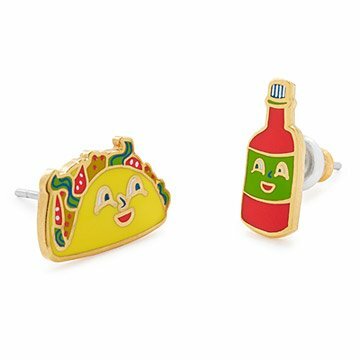 Designer Christine Schmidt's illustrations of a smiling taco and hot sauce bottle are perfectly captured in cloisonné, with brightly colored enamel framed in 22 karat gold. The pair of mismatched earrings, which have hypo-allergenic, stainless steel stud backs, come tastefully packaged in a decorative glass vial. Made in San Francisco. cute, unique design & packaging. i am disappointed how small the earrings are.